The BEST Strawberry Sheet Cake Ever. 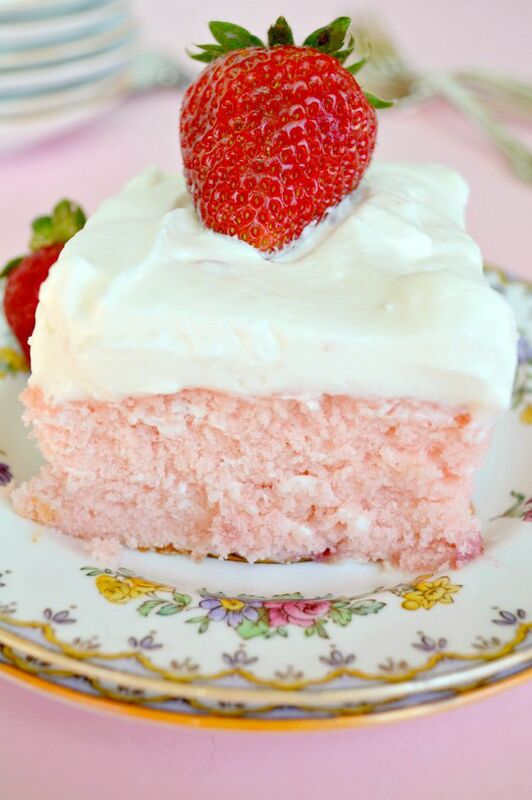 Tender, moist cake loaded with fresh strawberries then topped with a to-die-for Lemon Cream Cheese frosting! Bring this cake to the next potluck and you’ll be the Belle of Baked Goods! Is there anything more delightful than a strawberry sheet cake when the weather begins to warm up a little bit? I’m so, so, so excited to tell you about this recipe! 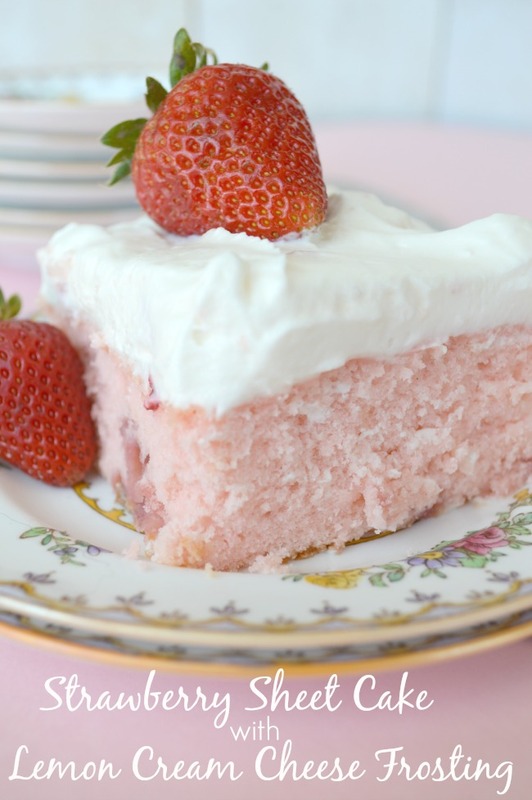 I’ve been totally craving strawberry cake for about a month now. 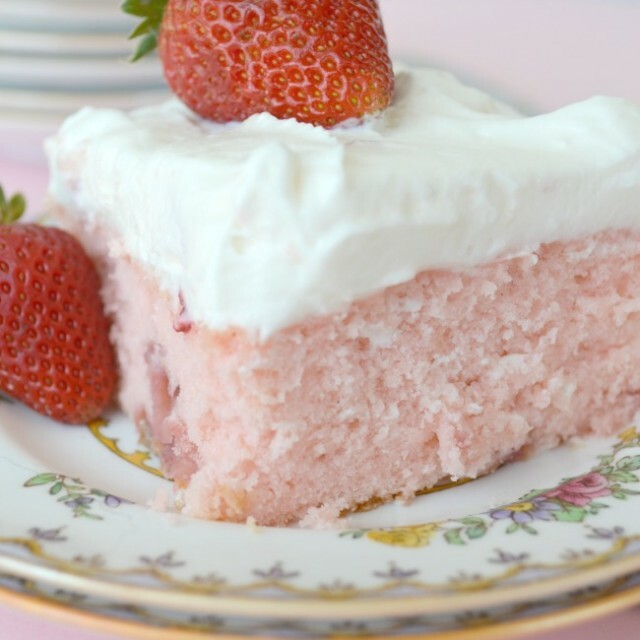 I was planning on making my favorite, Go To Amazing Strawberry Cake recipe when I saw this Strawberry Sheet Cake recipe in the Southern Living magazine. Now, when I have a favorite recipe, it’s really, really hard to get me to even consider trying a new one for a similar thing. 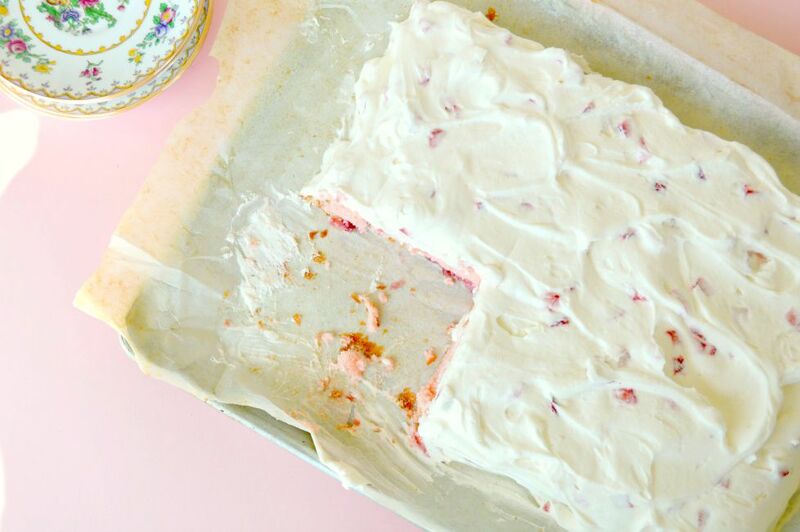 I really can’t, for the life of me, explain what possessed me to try this Strawberry Sheet Cake recipe when I love my other recipe soooo much, but OH MY GOSH, I’m soooo glad I did! Let me tell you about this, honest to goodness INCREDIBLE cake. Let’s start with the cake itself. It’s made with cake flour so of course its tender. It’s got buttermilk and lotsa butter in it so it’s really moist. Okay, stay with me, it has fresh strawberries and a sprinkle of strawberry jello in it, so it’s got the perfect “strawberryness” to the strawberry flavor. LET’S BE FRIENDS ON PINTEREST! WE’RE ALWAYS PINNING TASTY RECIPES! Seriously, leave it to Southern Living to come up with a frosting that can make grown men and women weep a bit when they taste it! The flavors of this cake make it absolutely perfect for spring and summer. It’s so yummy, I think it will be the perfect addition to my Easter buffet. I think I’ll make the cake the day before and refrigerate it overnight then make the frosting and frost it on Easter. Since the frosting is made with whipped cream it’s better served the same day its made. I hope you give this cake a try soon. Easy Pineapple Sheet Cake -a moist, pineapple-studded cake drenched in a sweet, creamy coconut icing, with crispy toasted pecans on top. Coconut Sheet Cake – Incredibly delicious, super moist, Coconut Sheet Cake topped with a perfect Coconut frosting. Pig Pickin Cake – Our crowd-pleasing Pig Pickin Cake is an incredibly moist, delicious, refreshingly fruity delight. Super easy to make, it’s sure to become a new favorite! The BEST Strawberry Sheet Cake Ever. Tender, moist cake loaded with fresh strawberries then topped with a to-die-for Lemon Cream Cheese to-die-for frosting! Bring this cake to the next potluck and you’ll be the Belle of Baked Goods! Preheat oven to 350 degrees. Spray a 9 X 13-inch baking dish with nonstick cooking spray. Line baking dish with parchment paper with the long sides extending 2-3 inches. Spray parchment with nonstick cooking spray. Using a stand up electric mixer, beat butter until creamy. Slowly add sugar then continue to beat 4-5 minutes until it's fluffy. Add eggs one at a time, and beat after each addition until they're incorporated. Add lemon juice and vanilla and mix in. In a small bowl combine flour, strawberry jello, baking soda, and salt. Add the flour mixture to butter mixture alternating with the buttermilk, beginning and ending with the flour mixture, mixing until just combined. Gently stir in strawberries. Pour batter into prepared baking pan and bake in preheated oven for 30-40 minutes or until a toothpick inserted in the center of the cake comes out clean. Cool cake completely. Lift the cake out of the pan, using the parchment paper extensions. Make the frosting: In a large bowl, beat the cream cheese with 1/3 cup of sugar until mixture is smooth. Fold in strawberries. In a large bowl, beat the cream and lemon juice until mixture is frothy. Continue beating on medium-high speed and gradually add the remaining 1/3 cup sugar. Beat until mixture forms stiff peaks. Fold half of the whipped cream mixture into the cream cheese mixture until just incorporated. Fold in the rest of the whipped cream mixture. Strawberry Spinach Salad – Pretty as a picture and tasty to boot, Strawberry Spinach Salad packs layers of flavor in every bite! Fruit and pecans balance the tangy dressing perfectly! Strawberry Salad – With baby arugula, crumbled blue cheese, halved fresh strawberries, and a homemade vinaigrette, Strawberry Salad is light and so berry delicious! Strawberry Cheesecake Salad – Take our Strawberry Cheesecake Salad with a Graham cracker crust on top to your next potluck, and everyone will be in creamy-dreamy, buttery-crumbly heaven! BEST. STRAWBERRY. CAKE. EVER! I will make this cake again and again. This looks so good and makes me wish we were heading back into summer! Lovely cake! My cake is taking longer than 40 min, is that normal? Would this cake be dense enough to stack in layers? So happy you liked the cake! Thank you so much for sharing all your experiences, Natasha! You absolutely made my day. It makes me so happy that you’ve made this cake so many times <3 You're a baking Rock Star!! My daughter requested a strawberry lemonade cake for her 13th birthday. I stumbled across this recipe and thought I would give it a whirl. Delicious! My husband has even requested that I make this for his birthday 9 months from now! This night be a new birthday go to. Hello Lisa. Wow! I’m so happy your family liked the cake so much! OK, you convinced me, I’m baking this cake on Wednesday for a large ladies’ get-together! I can’t wait! Love that it is so from scratch and not just a bunch of boxed items all combined. Yay!! I’ll let you know how it goes. Sorry, I didn’t care for it that much. I was expecting more of a real cake but this seemed more like a cobbler without the fruit part. It was quite dense and just not soft and fluffy like cakes normally are. Not your fault, it just wasn’t for me. The frosting was good, although I think I would prefer it with the lemon flavor of lemon zest rather than the tartness of the actual juice. But still good, especially in the combination of the cake since it gave the cake itself more flavor. Hi Claudia. I haven’t tried using lime, but I think it should work out really well. I’m going to make this to take to a party this Saturday! Must I limit the chopped strawberries to 2/3 cup each section (cake and icing) when I have so many? Hi Kathleen! I read through all of the comments to find a substitute for the Strawberry jello, as I haven’t found it here in Italy. I am hoping it is used just to intensify the flavor of strawberries. I will try using homemade strawberry jam to see if that works.. Also, I am making cupcakes! I made this cake for a family birthday and it was an absolute success! Everyone loved it and my father has requested it for his birthday cake for next June. I’m making it tomorrow for some special guests and I’m sure they will love it. Thanks for the wonderful share. The recipe looks great, but your printable version is not working, it’s trying to print 11 pages. Hi Mike. I’m so so sorry!!! I contacted my tech person the day you left the comment. Trying to get it fixed! I really appreciate you letting me know! I baked the cake batter in cupcakes. It is moist and yumm. But the sides of the cupcake have a light hard brown crust. Any idea why? I am planning to bake this today. I rcake looks sumptious. Can i bake it as cupcakes? Or what about as round cake pan? I made this to celebrate Mother’s Day last weekend and it was a hit! The cake and the frosting are both delicious, but the frosting really stood out for me – so light, fluffy, and delicious! HI WOULD THIS BE GOOD FOR A OUTDOOR WEDDING IN SEPTEMBER IN OR. IT COULD BE IN THE 80 TO 86 IS THAT OK FOR THIS CAKE THANK YOU DEBBY AND THE CAKE IS SO SO GOOD !!!!!!!!!!! Hi Debby, well, I have to say I worry about the frosting in the heat. The cream cheese and the whipped cream make it more perishable and for food safety require refrigeration. Thanks for your reply Kathleen I just looked at my comment and I left out the word cornflour or corn starch as you call it in the States. Add cornflour to plain flour to make cake flour. I live in Sydney now but I’ve also lived in the States and the jello gelatin powder (not to be confused with the jello you mix with milk) is the same as the jelly in Oz, we just spell it a different way. Cake flour is another product we don’t have but 2 tablespoons in a cup measure and then all purpose flour to make up a full cup is a great substitute. I haven’t found a strawberry cake I like from scratch and there are literally hundreds on the internet, most of them come out a dull purplish colour and that could be because our butter is really yellow. But this one looks good so I will give it a whirl. Thanks for sharing. Hi Nova. Thanks for your input. 😉 I hope you try the cake and enjoy it as much as we do! Hello ! I did not have cake flour on hand. I searched on google for a substitute. For each measured cup of regular flour, remove 2 Tablespoons, then add 2 Tablespoons of cornstarch. My cake is baking now ! I will comment on cake after finished baking ! SO SO GOOD! Brought me back to the wild strawberry fields on my grandparent’s farm when I was a child. Made it for our family Easter supper…huge success! Will use the frosting as a topping on other desserts. Hi Marie. I’m so happy to hear you liked the recipes and even happier to hear it stirred old memories. I think that’s the best when food does that! What about an adjustment for high altitude Any ideas? Hi Dawn. Sorry but I have no experience baking at high altitude. I’m literally at sea level! Sorry again and good luck!!! Thanks for your reply, Kathleen. I’ll let you know how it turns out at almost 5,000 feet of elevation. Happy Easter! Like a challenge and made all the conversions.. It’s not easy living down under sometimes! But we manage! Hi Gail , did you use a lamington size pan i,m in sydney a well ?? -Used a Lemon Cream Cheese icing recipe instead of this one because this icing wouldn’t be strong enough. Can not say enough great things about this recipe. Some of the best cake I have EVER tried or made!! Hi Ellen! Wow that sounds like a Delicious combination! Thanks so much for taking the time to comment. Love hearing how you put it together!!! Ok so I hate to waste stuff.. if we take out 2 tbsp of jello powder from the packaged, can we then make some jello on the side to use the rest up? Any idea on how much water to use in that case? I have this in the oven right now.. and it’s been in for 35 min and the top is brown but it’s most def not done.. it’s ..sloshy? Prayers.. Anyway in the meantime I figured out the jello.. if you’re using a SMALL box of it, there are 6 tablespoons inside so using 2 for the cake leaves 4 left.. which is 2/3 of the package so you need 2/3 cup boiling water and 2/3 cup cold water to prepare the remaining jello. I’m making this cake for my mother in law’s birthday tonight so I reaaaally hope this comes out. I can’t find any reason for the slosh in the pan.. I followed the recipe exactly. I don’t have a stand mixer but have always made do without one so I can’t see that being the cause. I wlill let you know how it turns out! Just made this yummy cake last nite for my little grand-daughters 4th birthday. She wanted a “pink” cake and this one looked perfect on Pinterest, and it really was perfect! It was moist, light and had a slight lemon tang to it, with a cool and creamy frosting. And I especially loved that it was a “scratch” cake… I don’t like cake mixes! We decorated it up with the Princesses’ from Frozen, wrote Happy Birthday on it with some icing I whipped up, and stuck some candles on it, and she loved it !! Thanks for such a good recipe that I will keep making for a very long time !! HI Katy! Happy belated birthday to your grand daughter! So happy you liked this cake and most importantly the birthday girl liked it too!!! This is the the second time I am making this cake. My family and friends love the surprise of the lemon. The second day it is the best. Make ahead is the best plan for this cake. I put it in the refrigerator and take it out two hours before service. It was fabulous. Thanks for sharing the recipe. Hey Ann thanks so much for sharing your experience 🙂 So glad you liked it! Hi Kathleen can I bake the cake in a round baking pan? Or does it have to be a sheet pan? Hi Kavya, I only make this recipe using the suggested pan because I LOVE the frosting and think it works best on a flat cake. I made this cake in a 12X17 sheet cake (jelly roll) pan and it turned out perfectly. The only thing I altered was the cooking time: 25 minutes worked for me in this size pan. The cake is delicious and the icing is great! I will use the icing recipe for other cakes, omitting or reducing the lemon as needed for various flavors of cake. Actually…I did alter one other thing: we are vegetarian, and so I used vegan strawberry jello powder (amazon.com) and it worked great, the cake is a pretty light pink color, and it has a wonderful strawberry flavor and tender cake texture! I made this delicious strawberry sheet cake and the people loved it!! Could I use the same recipe for a layer cake? Hey Linda and Beti! Sorry about that! Glich in the computer program. Hoping I fixed it!!!! I can’t get it to print either! I’m having problems printing out the recipe too. wondering if I can omit the jello, since its not good. or dou think it’s used to help thicken it? Hey Shelly! I’m sorry but I just don’t know. I’ve only made this cake with the gelatin in it. Just made this cake this afternoon and it is a keeper. i especially love the whipped frosting! YUMMY! Hey there Tahny! So glad you liked this! I’m with you on the frosting, girl!!! Hello — I wanted to print your recipe but something strange happens — when I press “print recipe” it brings up a black box with the name of the recipe & has a “print” button which I press — but all that is printed is the page with the black box on it, not the recipe. I wonder if anyone else has this problem. Hello Jeanne, Thank you for telling me. This is the first I’ve heard anyone has had a prolem. I’ll look into it asap. May need to get some tech support! We made it this weekend as a layer cake and cupcakes for my daughters birthday and it was delightful. I got so many requests for the recipe. Thanks! Hey Alicia. Happy to hear that. How did the frosting work for a layer cake? I’m confused as the title of the cake is Sheet Cake but it is baked in a 9×13 in. pan. I need the cake for a large gathering and wondered it if could be baked in a sheet cake pan and what the baking time would be. Hey Linda. I know, I don’t know why but this is the second recipe I’ve used recently that has referred to a sheet cake made in a 9X13. Anyway, I’m sorry but I haven’t made it in a larger pan so I can’t advise. Well- this cake tasted delicious for sure but yielded disastrous results when attempted as cupcakes!! Just thought I’d throw that out there in case anyone else was tempted. 🙂 Stick with the 9×13! Or if you figure out a way to turn it into good cupcakes let us know! Hi Grace! Thanks so much for sharing that!!! This cake is delicious! It’s my first from-scratch cake…I’m new to baking. The icing I made came out too runny. It still tasted yummy, though. Do you have any idea why this might have happened? Thank you soo much! I accidentally ran across this and I’m so happy I did!!! Now I always look through all your recipes 🙂 it is an amazing cake! Well Alena, I’m happy you found me! I hope you like this cake as much as we did!!! I made this for my wife today, IT WAS AMAZING. This will be my go to spring/summertime cake..Thank you for this recipe!! Hey EJ. So glad you made this! I’m really glad you liked it 🙂 You are so welcome! whipping cream to be used in frostings. Do you think that would work in this recipe and would make it last a little longer? I’m on a diet right now, but really like to bake just to get my house to smell delicious. Anyway, I want to whip some up, have one question, do I shake the buttermilk, THEN measure it, or measure THEN shake? I am diabetic, I was wondering if I could use truvia in place of the sugar & use sugarfree jello? I wondered about the pan size indicated in this recipe (9×13) when the title indicates this is a sheet cake, but I followed the recipe as written. Now my cake has been in the over for over 40 minutes and is nowhere near being done. I should have followed my gut and used a sheet cake pan which much larger. 🙁 My family is on the way for Easter dinner and I don’t think this cake is going to come through. Hi Katrina, I can’t imagine what happened. I definitely used a 9 X 13 inch baking pan and it worked out perfectly. Is is possible your oven runs cooler so it baked slower? I’m having the same problem.. 45 min and still in there.. since the top browned already I covered it with foil. This might be a silly question but it’s titled sheet cake and the directions say a 9×13 dish. So do you mean a 9×13 sheet cake pan or a 9×13 baking dish? We made it for Easter in a 9×13 sheet pan and it doesn’t seem right. Thanks! Hey Sammi, I used a regular old 9 X 13 baking dish. How did your cake turn out? I assume you refrigerate any leftovers? How long then should we bake for cupcakes? Jeanette, I haven’t made cupcakes yet so I’m sorry I’m not exactly sure. I want to do something different for Easter. In steps 4 and 5, are they mixed together at the end. Also do I use half the cream cheese for in both mixtures? Hi Kimmela. In step 4 you’re making a sweetened cream cheese by beating ALL of the cream cheese with 1/3 cup of sugar. In step 5, in another bowl, you beat the heavy cream with the lemon juice until frothy, then continue beating and add 1/3 c sugar until it creates stiff peaks. You’re making a flavored whipped cream in step 5. Then, once you’ve made the whipped cream, you fold 1/2 of it into the sweetened cream cheese mixture from step 4. When it’s incorporated you fold in the second 1/2 of the sweetened cream cheese mixture just until it’s incorporated. Do you think this cake would work to double the receipe and cook in a jelly roll pan? I want to make this for Easter for our large family. Hey Carrie, I’m so sorry to reply so late to you! I’ve had a family emergency and have been out of town until today! I don’t think the jelly roll pan would work because I think there is too much batter. Oh I just saw the comment about the frosting being to light to layer. I think I’ll bake the cake in a bundt pan instead. I interested in making this recipe as a three layer cake. Do you think doubling the recipe would yield enough batter and frosting? I have a question about the icing recipe. 18%. Should I be buying a whipping cream?? Hi Darlene, I’ve sent you an email. I think you should use the Heavy Cream instead of the Table Cream. Heavy Cream is 33%. I’ve never whipped up the lighter cream so I’m worried it might not be the right consistency or richness. This looks so good and I’m going to make it for Easter. do you think this would work as a layer cake, or is the frosting to “light” to keep it together? Hey Gaela. Yes, I do think that this frosting would be too light to use in a layer cake. I think it just might “squish” out between the layers! Is the strawberry jello the instant or cook to serve jello? I am not sure if it would make a difference, but it does not hurt to ask! Hi Lindsay! I just checked the original recipe and it didn’t specify. I don’t think it matters. Honestly, I can’t remember which one I used!! !LOL Sorry bout that! Do you think this would work as cupcakes too? Yes I think they’d be delish! Another “stupid” question but am I correct in assuming that the jello isn’t already made and is still in powder form? Do you have to line the pan with parchment paper? I don’t want to lift the cake out of the pan as I would not have a serving dish to put it on…. Hi Donna, no then I wouldnt bother! In most of the pics, it looks like you omitted the chopped strawberries from the frosting because I don’t see them. I think I it looks better not seeing the chopped strawberries in the frosting and just garnishing with a fresh berry on top of each slice. Hi Susie. You’re right it doesn’t look like I added the strawberries to the frosting but I did. The recipe doesn’t have an overwhelming amount in the frosting. Funny thing is my sister and I had a long debate over this issue. She thought it would be better if they were only on the top-I like them in the frosting! LOL. I made it last night. Shared it with my neighbors. Just one word perfection! So moist, tangy, and when you bite into the chopped strawberries. Gosh! I can’t wait for my mom to visit so I can serve this up. Thanks for sharing this one. Hazel, I’m so happy to hear that you enjoyed it! Hazel, I hope you like it as much as we did! Stupid question but what’s cake flour? Is that the same as cake mix? Not a stupid question at all and I’m happy you asked it 🙂 It’s a special flour that you buy in the baking section in a box. It isn’t a cake mix. It’s a flour that has lower protein that regular all purpose flour so it produces a more tender cake. Hi There! I live in Italy and have found tipo 00 which is a super refined flour, self rising flour and that’s about it in terms of a white flour for cakes and breads, aside from grainy flour of course. Think that would work? Hi Valerie. I have to say honestly since I haven’t baked with those specific products I really am not sure. I wish I could be more helpful! Hi Maria. Thanks so much for sharing! Ahhh.. Grazie Maria! Il Molino è perfetto! Pensavo che tipo 00 èd aguale di cake flour. La farò subito!!! Grazie mille! Is the sugar thats in the frosting granulated or powdered?